BioWare have entered the podcast fray with a pilot episode of their official podcast. It’s a very polished product as you’d expect, and there’s no doubt they’ll have lots of interesting info to share ongoing. There’s no confirmation of how regular the podcasts will be, but they’l certainly be worth following. 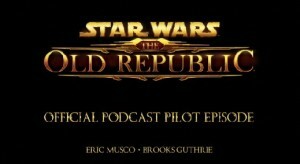 Of course, you won’t get a lot of criticism or analysis of any issues SWTOR may be having – that’s what our own podcast is for of course!